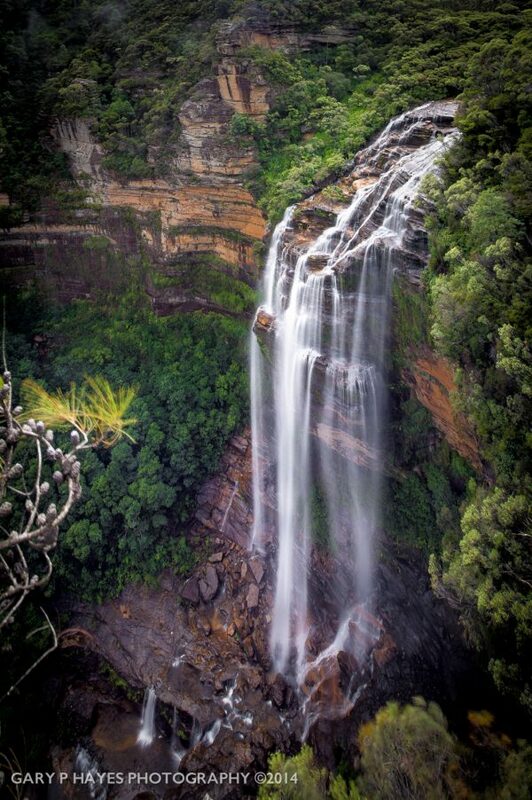 ABOUT: This lookout gives the best full view of Wentworth Falls top section albeit from a downward looking angle. It also offers good views out into the Jamison to the left of the falls and is excellent on partially misty days with the mist swirling around the deep valley in front of you. PHOTO EQUIPMENT TO BRING: It has a 3ft wall all around this lookout and not ideally suited to long tripods. I have found a collapsed tripod can be safely position on the thick wall, while keeping hold of it, for downward looking shots. A perspective correction or shift lens is ideal here, but you can do that later in software if required. A neutral density filter to block some light for smooth water. GETTING TO THE SPOT/S: Two routes. One from Tableland and one from main Wentworth Falls car park. The easiest one is the main falls car park, follow the trail over the stepping stones on top of the main falls. Just after these a trail leads up left towards Rocket Point. It is about a 7 minute up hill walk, first bit rocky, after that easy.